Professor of Textile Design and Hand Papermaking at the University of Wisconsin-Madison and proprietor of HARK! Handmade Paper Studio in St. Paul, Minnesota. Mary produces editions of linen and flax papers for book designers and artists, as well as unique paper-artworks that combine handmade papers with mixed media. Her work has been exhibited and collected internationally. Hark received a Fulbright Senior Research Award to Sub-Saharan Africa where she began her research into Ghanaian handmade paper. Mr. Asaam is an environmentalist and landscape designer committed to sustainable practice. He works as a financial specialist for the Forestry Commission of Ghana in Accra. Mr. Asaam is part of a team that oversees the public lands where the invasive Pulp Mulberry is growing, and travels throughout Ghana and internationally, working on sustainable land management projects. Proprietor’s of Dr. T-Bone Services Ltd. in Ejisu, Ghana, an award-winning metal design and fabrication enterprise that includes an iron forge. The Amankawaa’s are established small business owners with a long-standing commitment to good design, fine craft, fair business practice, and local economic development. 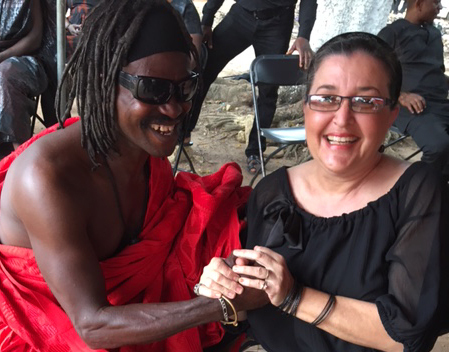 Get updates from The Krataa Foundation and Ghana Paper Project!